Before reading any further first check out if your cooking skills meets the following requirements in order to make this recipe. Should be Good at: CUT, THROW and TOSS. Yes, the easy, peasy recipe is dedicated to all the bachelors and husbands who does claim that they have no cooking experience at all. At least give this a try to make your wife taste some one's cooking ( to break the the routine). Wash the Potatoes ( i usually leave the skins on, for these potato the skin gives extra flavor) and pat them dry. Pour the olive oil mixture on top of the vegetables. 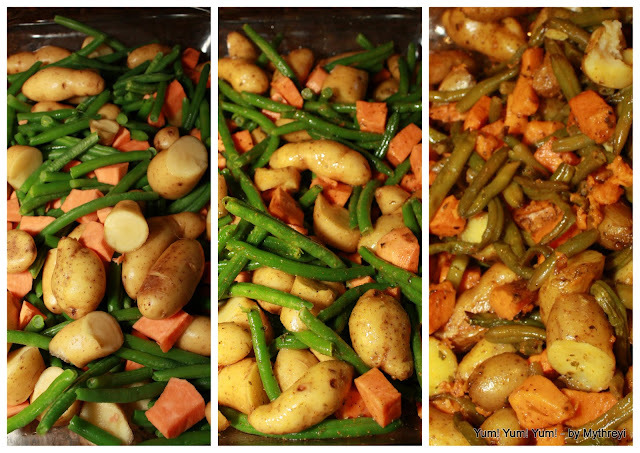 TOSS all the vegetables together (up & down) so that they are well coated with the seasoning. After 1 hour turn off the oven and take it out carefully and serve hot. 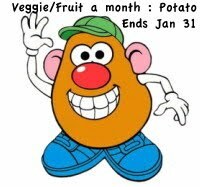 Save the rest in refrigerator and can use it for 3 to 4 days. Yum! Yum! Yum! vegetables on the side are ready. Well, as you have witnessed No cooking is required and it is so simple., Cooking is not hard ( well, only some times). This recipe is going to Divya's DilSe, Veggie of the Month Event started by Priya at Mharo Rajasthan's Recipes.